Acclaimed as the Lord of good beginnings, the remover of obstacles and the harbinger of wisdom, success and prosperity, Lord Ganesh is like a universal God, worshipped by Hindus all over India. Every community has its key presiding deity; however, Ganesha is included in everybody’s prayers. So, there is not a day when he is not welcomed into our minds and homes. But around the corner is that one special time when he is celebrated gloriously, with pomp and splendor. Yes, Ganesh Chathurthi or Ganpati Utsav is here! Every year, during this utsav, Lord Ganesh is welcomed into millions of homes. For 10 days, he is decked up beautifully in silks and flowers, and worshipped lovingly with all his favourite delicacies ranging from Modak to Ladoos. Each morning, a cup of milk or curds, or better still, a cup of Panchamrut is offered to Him. Panchamrut Prasad is a must-have for most Indian rituals. It combines milk, curd, ghee, honey and sugar – ingredients that denote prosperity and purity. Basil, which is the abode of Goddess Lakshmi, is also added to the Panchamrut to make it holier. We give you a delectable selection of Ladoos and Modaks to make during the Ganpati festival. Rather than stick to the same Modak every day, you can make different types of Modak and Ladoos like Mawa Modak, Fried Modak, Churma Ladoo, Besan Laddoo etc., pleasing both Lord Ganesh and your family! On a hurried day, you can make Rava Sheera instead. We also show you how to make the mandatory Panchamrut. While each family has a different selection of traditional recipes to prepare for Ganpati, the recipes presented here are quintessential ones prepared in most homes. Enjoy the festivities, prepare amazing delicacies and receive the blessings of Lord Ganesh, along with innumerable compliments from near and dear ones! Try our other festival recipes. A lighter version of the conventional carrot halwa. It contains a lot less fat. An evergreen favourite, a book on sprouts can never be complete without matki pulao! ensure that the matki is cooked just right and not mushy. During Ganesha festival, many sweet and savoury dishes are made and it is the perfect time for the family to celebrate the spirit of togetherness. Tarla Dalal Hi Jenitha, Thank you so much for your kind words. Happy to know you liked our recipe collection Do try more and more recipes and share with us your feedback. Happy Cooking! 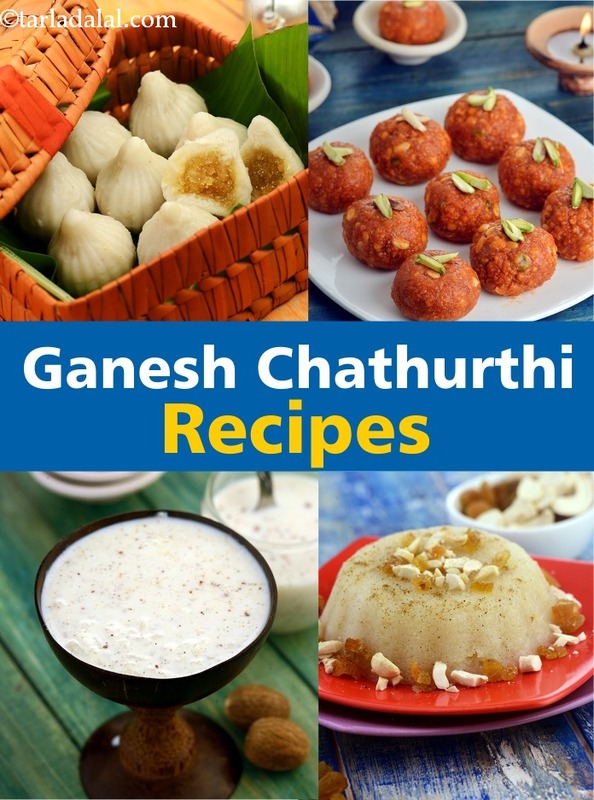 Loved your collection of Ganesh Chaturthi recipes.